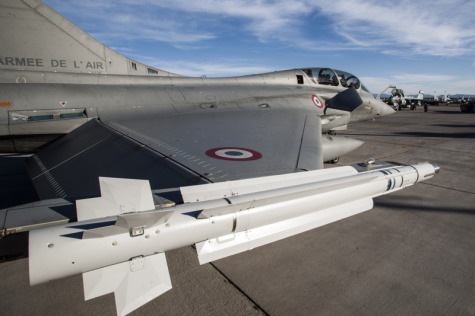 PARIS --- Following the decision of Armed Forces Minister Florence Parly, the Directorate General of Armaments (DGA) on November 6 awarded MBDA a contract for the acquisition of 567 MICA NG missiles as well as the pyrotechnic modernization of 300 MICA* already in service. Delivered from 2026, the MICA NG will equip the Rafale and replace the MICA air-to-air missiles in service since the early 2000s. They are intended to renew the medium-range interception, close combat and self-defense capabilities of Rafale combat aircraft of the French Air Force and the French Navy. Developed in two versions - infrared (IR) and electromagnetic (EM) - these innovative missiles in the areas of auto homing and propulsion help to maintain an operational advantage in the face of evolving threats. In the dynamics of strategic autonomy desired by the Minister of the Armed Forces, none of their components will be subject to restrictions of employment imposed by third-party countries. The MICA NG will be carried by the Rafale from standard F3-R onwards. In addition to MBDA, the manufacturers involved in this project are in particular Thales, Safran and Roxel, for the homing heads and propulsion. In accordance with the political will to rebalance the relations between the State and the industry, the latter also assumes a significant part of the development costs. The contract also provides for royalties, as well as a mechanism for reducing the price of missiles acquired by France according to the number of missiles produced for export. The contract also includes the pyrotechnic renovation of part of the current MICA missile fleet to allow their use until 2030 by all aircraft that already carry or will carry MICA (Rafale all standard, Mirage 2000-5 Mirage 2000D renovated). * MICA: interception missile, combat and self-defense. MICA NG is intended as the replacement for the MICA missiles currently in operational service with the French armed forces and exported to 14 countries worldwide. The NG programme includes an extensive redesign of the current MICA family while keeping the same aerodynamics, mass and centre of gravity. This is done to minimise the amount of adaptation required to operate the new system with existing platforms and launchers. The unique concept that has ensured the ongoing success of MICA for two decades remains: the option of two different seekers (infrared and radio frequency) and two launch modes (rail and ejection) in a single missile casing. Utilising a new double-pulse rocket motor will also provide additional energy to the missile at the end of its flight to improve manoeuvrability and the ability to intercept long-range targets. Lastly, the addition of internal sensors will allow the monitoring of the status of the weapon throughout its life (including during storage and transport), contributing to significantly reduced maintenance requirements and cost of ownership. MICA entered service in 1997, and was designed to replace the short-term MAGIC 2 missile and the medium-range Super 530 D missile with a single weapon system equipped with two interchangeable seekers: one being radio frequency and the other infrared. Approximately 5,000 MICA missiles in various versions have been ordered by 22 armed forces around the world. With a significant presence in five European countries and within the USA, in 2017 MBDA achieved revenue of 3.1 billion euros with an order book of 16.8 billion euros. With more than 90 armed forces customers in the world, MBDA is a world leader in missiles and missile systems. MBDA is owned jointly by Airbus (37.5%), BAE Systems (37.5%), and Leonardo (25%).